The double revolving field theory can be effectively used to obtain the equivalent circuit of a single phase induction motor. The method consists of determining the values of both the fields clockwise and anticlockwise at any given slip. When the two fields are known, the torque produced by each can be obtained. The difference between these two torques is the net torque acting on the rotor. Imagine the single phase induction motor is made up of one stator winding and two imaginary rotor windings. One rotor is rotating in forward direction i.e. in the direction of rotating magnetic field with slip s while other is rotating in backward direction i.e. 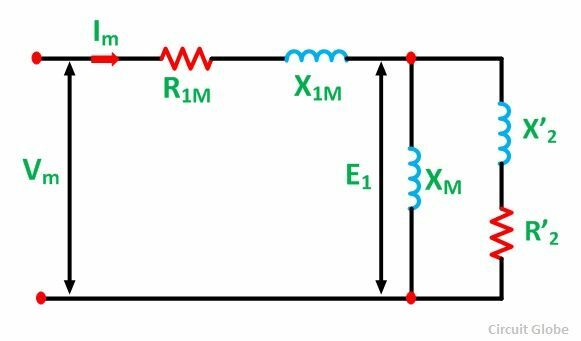 in direction of oppositely directed rotating magnetic field with slip 2 – s.
To develop the equivalent circuit, let us assume initially that the core loss is absent. The resistance of forward field rotor is r2/s while the resistance of backward field rotor is r2 /(2 – s). The r2 value is half of the actual rotor resistance referred to stator. As the core loss is neglected, Ro is not existing in the equivalent circuit. The xo is half of the actual magnetising reactance of the motor. So the equivalent circuit referred to stator is shown in the Fig.1. While the impedance of the backward field rotor is Zb which is parallel combination of (0 + j xo) and (r2 / 2-s) + j x2. Under standstill condition, s = 1 and 2 – s = 1 hence Zf = Zb and hence Vf = Vb . But in the running condition, Vf becomes almost 90 to 95% of the applied voltage. If the core loss is to be considered then it is necessary to connect a resistance in parallel with, in an exciting branch of each rotor is half the value of actual core loss resistance. Thus the equivalent circuit with core loss can be shown as in the Fig. 2. All other expressions remains same as stated earlier in case of equivalent circuit without core loss.